Here's my vote for Zachary Maxwell, kid filmmaker of the year!!! Guerrilla filmmakers often face crackdowns by the powers that be, and Zachary Maxwell is no exception. His hidden-camera documentary was almost derailed last year when he was caught filming without permission by a fearsome enforcer – the lunchroom monitor in his school cafeteria. “She sent me to my teacher, and my teacher told me to delete everything,” said Zachary, who is now 11. Next month, the film (watch trailer), which has been playing the festival circuit, will be screened at the Manhattan Film Festival. Like many things in the life of a fourth grader, Zachary’s movie started as a dispute with his parents. He told them that he wanted to start packing his own lunch, but they were skeptical. Lunch is free at his school, P.S. 130 Hernando De Soto in Little Italy, and his parents liked the look of the Department of Education’s online menus, which describe delicious meals, full of whole grains and fresh vegetables, some even designed by celebrity chefs. So he smuggled in a camera in his sweatshirt pocket the next day and filmed lunch. “When I came back home and showed them the footage, they were like, ugh!” he said. In the film, Zachary, who is not above cheesy costumes and goofy special effects, makes a point that is under the radar of most conversations about the quality of school lunches: that despite the Education Department’s efforts to improve nutrition, there is a disconnect between the wholesome meals described on school menus and the soggy, deep-fried nuggets frequently dished up in the lunchrooms. 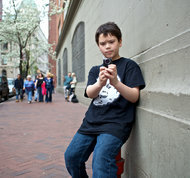 Benjamin Norman for The New York TimesZachary outside his school in Little Italy. The film offers no shortage of examples. On a day advertising “cheesy lasagna rolls with tomato basil sauce, roasted spinach with garlic and herbs,” for instance, Zachary is handed a plastic-wrapped grilled cheese sandwich on an otherwise bare plastic foam tray. A “Pasta Party” is described as “zesty Italian meatballs with tomato-basil sauce, whole grain pasta, Parmesan cheese and roasted capri vegetables.” Meatballs and pasta show up on the tray, if none too zesty-looking, but the vegetables are nowhere to be seen. Salads devised by the Food Network chefs Rachael Ray andEllie Krieger are similarly plagued by missing ingredients. On the day Ms. Ray’s “Yum-O! Marinated Tomato Salad” is listed, Zachary is served a slice of pizza accompanied by a wisp of lettuce. Indeed, among the 75 lunches that Zachary recorded – chosen randomly, he swears – he found the menus to be “substantially” accurate, with two or more of the advertised menu items served, only 51 percent of the time. The menus were “totally” accurate, with all of the advertised items served, only 16 percent of the time. And by Zachary’s count, 28 percent of the lunches he recorded were built around either pizza or cheese sticks. A spokeswoman for the Education Department, Marge Feinberg, said in an e-mail that vegetables and fruit were served daily and she suggested that Zachary must have chosen not to take the vegetables served in his cafeteria. “It would not be the first time a youngster would find a way to get out of eating vegetables,” she wrote. Zachary responded that he always took every item he was offered. Until this past September, Ms. Feinberg said, schools did have some freedom to deviate from the systemwide lunch menus. New federal regulations for the current school yearset stricter guidelines for what elements need to be on each child’s plate. On Monday, Zachary thought he was in trouble again when he was sent to the principal’s office and found two men in black suits waiting for him. They turned out to be representatives from the Education Department’s Office of School Food, he said, who complimented him on his movie, asked for feedback on some new menu choices, and took him on a tour of the cafeteria kitchen. There, Zachary met one of his school’s cooks, and got some insight into her thinking. Then he sat down for lunch with the officials. The adults ate the cafeteria lunch of chicken nuggets, carrots and salad. Zachary had pork and vegetable dumplings – brought from home.